Weiser Troy locking knobset with locking turn button on inside and key lock on outside. 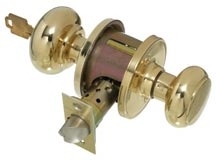 49mm diameter door knob on a 67mm diameter back rose. Supplied complete with fixings, adjustable latch backset, 60mm or 70mm, which automatically deadlocks when door is in the closed position. Avaiable in a brass finish only.